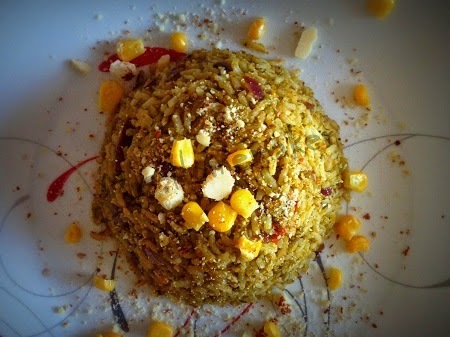 Rejuvenating green rice flavored with Parsley and served hot with crunchy almonds Parmesan . Parsley is one of the world's best herb or spice that is cultivated in Europe and widely used in Mediterranean cuisine , esp in Italian Cuisine . This gorgeous green bunch is also a load of health benefits which may make it one of the World's healthiest herb besides it's usage as a "garnish" on food .If consumed this may help to alleviate problems like arthritis , and promotes healthy heart , and floods your body with anti oxidants which aid you from many infections . This dish I am sharing today is Italian , as I have used all the Italian cuisine must haves , which includes even cheese , to make a complete Vegan meal I have used Almonds Parmesan instead of cheese. 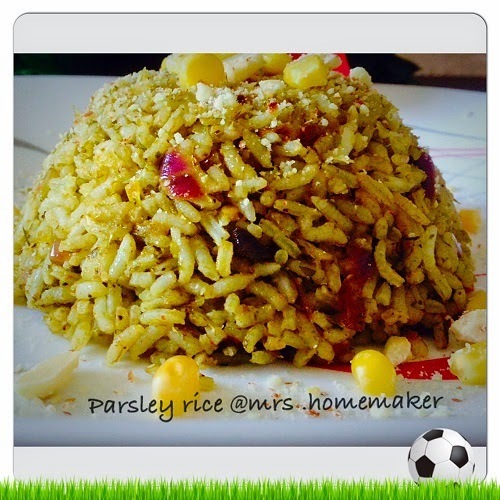 Italians do make Pilaf with Rice, veggies and meat , which inspired me to make this dish with Parsley as main ingredient which gave a unique flavor to the rice and made this a must have in my hubby's lunch box . 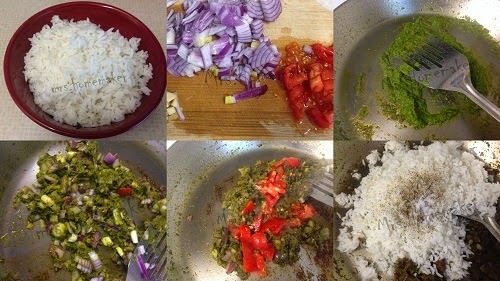 Parsley do look similar to Coriander but with mild flavor and taste unique to that of coriander , so if you want to treat your taste buds with a different flavor than usual try this simple recipe and leave your guests to wonder , that even a herb can be used for flavoring the entire dish without any spices . 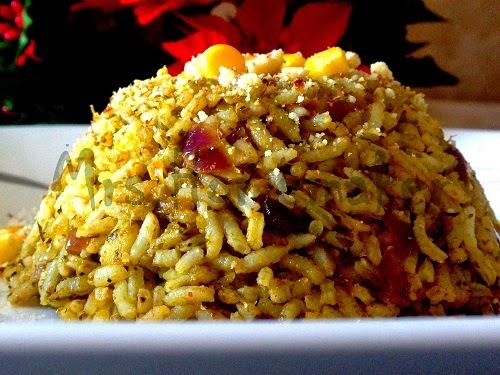 Parsley's unique flavor make it a must have in Italian dishes esp in Pizzas, Pasta or soups and now this rice gives it a new place even in Indian cuisine . 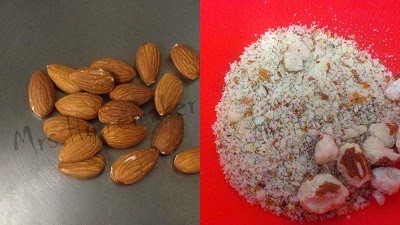 Step 1: Toast almonds , and blend them into a coarse powder , add in olive oil and garlic powder , give a good toss and set aside . 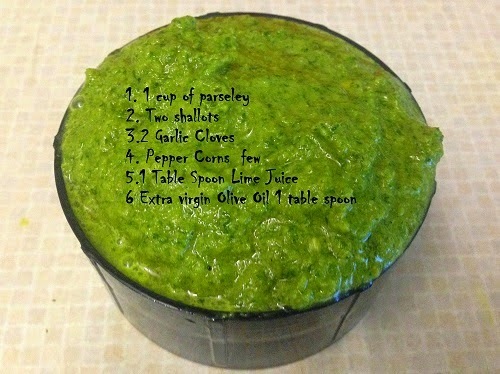 Step 2: Take fresh parsley , soak in cold water , and rinse thoroughly, add it to a blending jar along with shallots, garlic pods 2 to 3 , few pepper corns and a table spoon of lime juice . Give it pulses such that it becomes a smooth paste without any residues . Now add in Extra virgin olive oil and give some more pulses such that oil blend in the mixture . Step 4: Add in chopped onions , and chopped garlic pods at this stage , and cook until onions turn translucent (You need not cook until the onions are completely done). Step 5: Now add in chopped tomato and toss in some salt and cook until tomatoes are smooth enough . 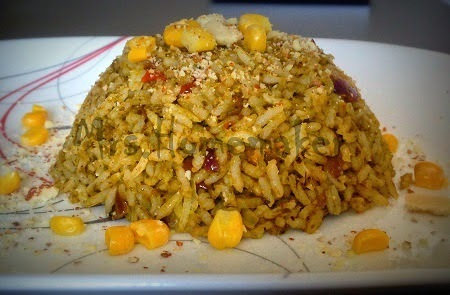 Step 6: Throw in the rice along with pepper powder and salt . Give a gentle toss such that rice wont break . Finally drizzle in remaining extra virgin Olive oil and give a quick and gentle toss . You can use cheese if you prefer to be more authentic . A Truly a Nutritious Dish for people of active life!